Recent posts have been about applying our faith. The greatest example of the use of applied faith is found in the life of Jesus. The basis of Christianity is faith and is built up by prayer. Like a seed planted in fertile soil, prayer mixed with faith gives growth to all good plans or ideas. Faith gives life, power, and action to prayers. It is the start of greatness and the chemical or element which, when mixed with prayer, gives one direct communication with God. 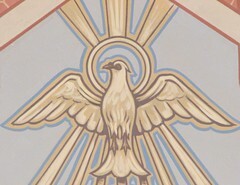 When Jesus was praying, heaven opened and the Holy Spirit descended on him in bodily form like a dove (Luke 3:21-38). Let us take note that the public ministry of Jesus began at the age of thirty, after great preparation, prayer, and receiving of the Holy Spirit – the same divine resource God has provided for you; a resource of instruction and empowerment to help you live a reinvigorated life of firm witness of Christ. Here are some other examples of applied faith found in the bible. In John 5:1-9, a sick man wanted to be healed and spent 38 years thinking that getting into the pool for healing was the way. His faith in Jesus and his willingness to take action was an immediate cure. This example teaches us that having faith and applying our faith is extremely productive. If you study the Old Testament, the prophets would tell the kings what they needed to do. We know from hindsight that things would have worked out much better if they had only followed this guidance. The good news is that these same principles are applicable today and each day that goes by gives us another day of recorded history we can model after. Let us have faith in the principles of God. Let us work on these principles throughout life. Much like playing golf, let us keep a scorecard and try to improve our score by applying these principles to everything we do. In Luke 2:21-39, the Holy Spirit was upon Simeon and he was moved. Just like Simeon, let us take the first step in faith knowing the Spirit will build around us the resources needed. The Spirit is the intermediary, which links one’s prayers with God. The positive emotions like desire, faith, love, enthusiasm, and hope are stimuli, which help us reach and influence the Spirit. The positive emotions feed the Spirit and are found by studying the Bible, going to church, and through fellowship with others working together. The negative emotions like fear, jealousy, hatred, revenge, greed, superstition, and anger hamper the Spirit. These negatives are like weeds to a garden. But the more positive emotions choke out these weeds. When mixed with faith and prayer, they help the Spirit become the intermediary with God to bring back answers to our prayers. Let us seek God’s plan for our day, take action on the plan, and be persistent in carrying out the plan. Imagine if we could see like David. His vision recognized a way to kill the giant by using a developed skill with the slingshot. We also can develop skills with the use of God’s principles to slay our enemies. Think of steps that can be taken so we build on what God has done yesterday and help dream big dreams for tomorrow. Let us be humble before God with a daily prayer time and find victory through Him. Let us be like Paul who applied his faith to produce extraordinary results. Let us see ways God can use us. Let us exercise our faith and believe in future increases in wisdom and job skills. Let us be successful as individuals but also balance this success with morality. This entry was posted in Applied Faith and tagged Bible, Christ, Christianity, Faith, God, having faith, HolySpirit, Old Testament, Prayer, religion, resource god, spirituality. Bookmark the permalink.